Different filters (patch stops) printed on overhead foil. 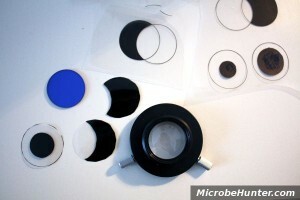 The blue filter on the left is a commercial blue glass filter, on the bottom: the condenser with the 2 centering screws. Commercial microscope filters are usually made of stained glass. In the case of patch stops (as used in dark-field illumination), they may be made of aluminum. The dark-field patch stops block some of the light and the specimen will appear bright on dark background. The traditional way of DIY patch stops is cutting them out from black cardboard, but I consider this somewhat difficult to do, and it’s not the most elegant way. You do need a condenser with a filter holder, of course. Making Patch stops for dark-field illumination. Measure the diameter of the filter holder of your condenser. Using a program, such as PowerPoint or OpenOffice Impress to draw a circle, fill-color white, of the same diameter as the filter holder. You can adjust the size of the circle in the context menu. Draw a smaller black circle into the center. Copy-paste both circles and then change the size of the inner smaller circle. You want to make several filters to find the one that works best. Print the filters on overhead foil. Print with a laser printer. The overhead foils for laser printers are more heat resistant. Take a black marker and darken the black inner circle. For microscopy work, take two of these filters and place them on top of each other. This ensures that the central circle is completely black. Place the filter into the filter holder, completely open the condenser aperture diaphragm and the field diaphram (should you have one). Try out the different objectives and find the suitable filter/objective combination. The method is very similar to making patch stops for dark filed. In this case, light is only allowed to hit the specimen from one side only. This will produce a relief-like image. Draw a black and a white circle of the diameter of the condenser filter holder. Overlap the two circles, so that the white circle covers part of the black circle. The white circle should not reach the center of the black circle. Cut out and proceed as described for making a dark field patch stop. Again it is necessary to experiment to find the appropriate filter/objective combination. Maybe you want to show yellow specimens on a blue background. Take the dimensions of the dark-field patch stop and color the center yellow and the periphery blue (color printer!). You have to use intensive colors to achieve an effect. Try different color combinations.